Weagree’s online contract creation software accelerates contract drafting. Users answer a user-friendly questionnaire and generate a tailor-made first draft agreement, based on their own models and templates. 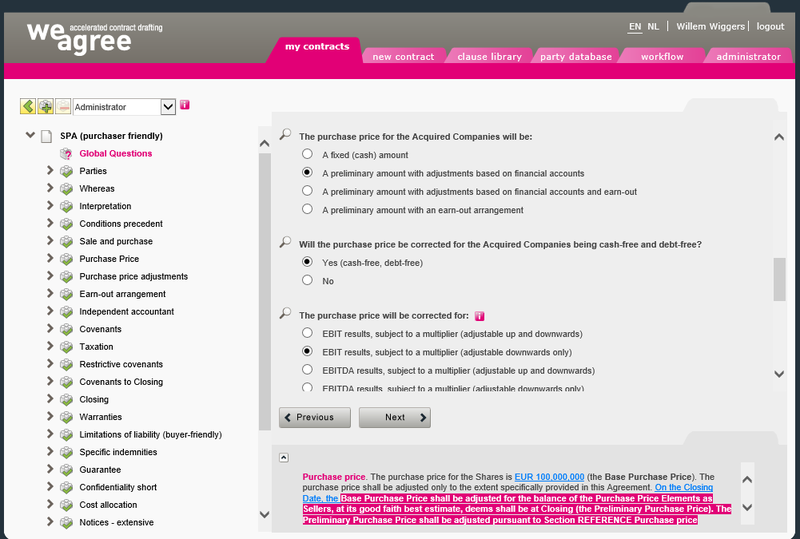 The generated contracts – simple or complex – meet the highest standards of contract styling and document formatting. 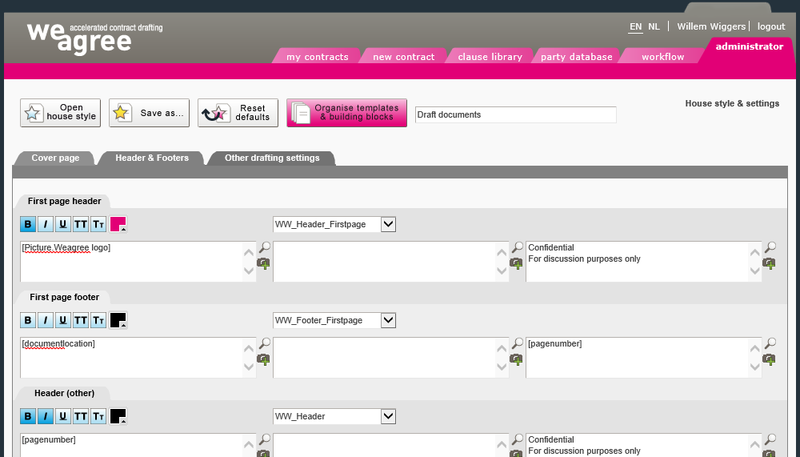 Our Weagree Wizard is uniquely user-friendly and implies (a) less change-management challenges, and (b) ease of inserting or modifying templates and questionnaires. Our automated contract assembly solution significantly improves productivity, response-time, compliance with contracting requirements, quality of contracting and contract knowhow management. We explain highlights of your business case for contract automation here. The Weagree Wizard expedites both routine and highly complex drafting work. In routine contracts, copy-paste and search-replace drafting and related errors are avoided. Highly complex drafting work, such as for SPA’s and joint venture agreements, can be simplified thanks to the vigorous (modular) setup of the Wizard. We created a 12 minutes demo movie. 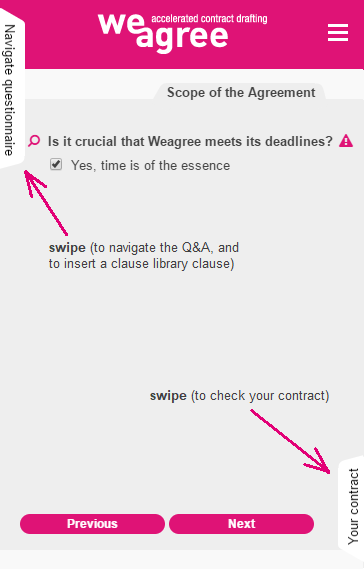 The Weagree document automation wizard implies powerful contract knowhow management functionality. Model contracts and individual model contract clauses are organised and maintained from one central location in a highly user-friendly manner. An important change-management aspect of implementing contract automation is the quality of the Q&A alongside the model contract. An effective questionnaire helps bridge a gap between ‘legal’ and ‘the business’: it does not contain an overflow of information on the screen, because when answering the Q&A for a third time, one is not reading an abundance of text anymore, and the contractual details are anyhow visible in the ‘WYSIWYG-underwaterscreen’. Guidance and explanatory notes are accessible through a subtle info-icon next to the question. Formulating the questionnaire is a discipline of its own and requires knowledge of both the legal issues and the business’ contracting practice. The Weagree contract automation wizard contains a workflow, allowing a legal department to introduce approval rights and to monitor compliance. This functionality justifies access rights to the contract creation application for business line managers, with the option to release the contract itself only after approval by the responsible in-house lawyer. Furthermore, the workflow enables a legal department to keep track of the status of all pending transactions. The Weagree document automation wizard features centralised contract house style management, which means all your contracts will have the same tailored ‘look & feel’. Accordingly, a change of house style (e.g. font size, indentation, numbering style, header & footer texts) requires only a few minutes to apply to all contracts subsequently created. The Weagree contract assembly wizard is equipped with a set of high quality contract templates. The customer can modify and expand them according to its business requirements. For more detailed information see FAQ.